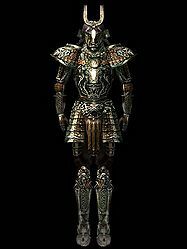 Orcish armor is an ornate, light steel plate design which is worn over cloth padding resulting in a light and comfortable fit when compared to other steel plate designs. Not surprisingly, it is most favored by Orcs, although it is not exclusive to their race. You'll probably have to kill people to get it, as it is not sold in many locations. But a raid of any Daedric Shrine to Malacath should net a full set or two. There are very few Orcish weapons available, as they are more well-known as crafters of armor. However, the few that exist are fine weapons indeed, out-classing most other weapons in their respective classes in terms of damage. This page was last modified on 9 April 2018, at 19:39.